This early 20th century cartoon from Puck Magazine is remarkably prescient. 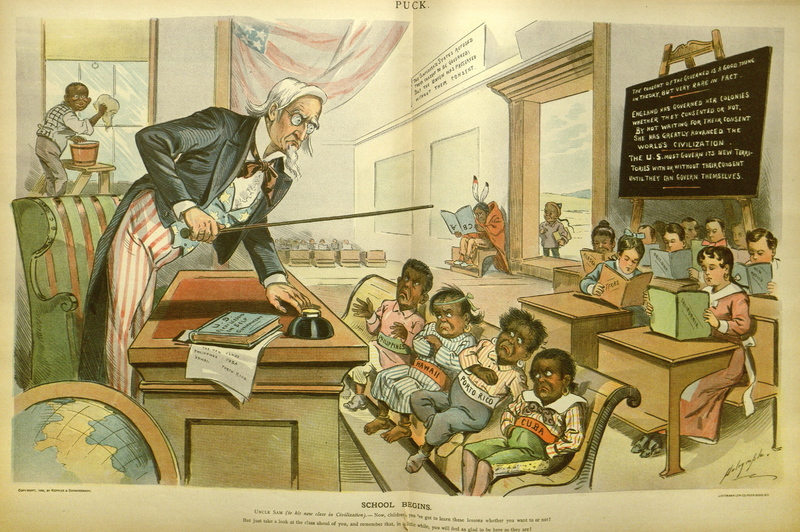 It shows a towering Uncle Sam “teaching” four terrified children: Philippines, Hawaii, Porto Rico, Cuba. A black child washes a window. A native american child holds a book upside down. The white children, of course, are reading about themselves and beyond reproach. When we look inside our country today, some of the faces are different. Things haven’t changed very much. Did you notice that the Asian American child is outside of the classroom altogether? Perpetually perceived as an outsider? Interesting how the four island nations sitting in front have been whitened over the years. Right,67% whites are less bright and more prone to cooky religions and non education,whilst 80% Puerto Ricans are smarter starting with 2 languages,non burning of the goddamn draft cards and being brave always and all ways! No, things haven’t changed that much!